Andrzej Wajda. Official Website of Polish movie director - Films - "Rough Treatment"
One day Daniel Olbrychski dropped by our home in Zoliborz to unload his troubles. Several times, when describing an unpleasant and unexpected experience, he repeated that he had been "roughly treated". The phrase caught my attention. It seemed aptly to define some of the things then going on in our public life. I can't recall the details of my conversation with Agnieszka Holland, but she instantly knew what I had in mind. The script was soon ready, which encouraged me to go on and make the film. During the fairly clement "late-Gierek" period disgusting affairs such as these were by no means rare. People were unexpectedly expelled from their positions without any possibility of defending themselves. Whatever contacts they had were suddenly severed, and their telephones went deaf. All they had left were their families and friends - when these were willing to share their fate. Sometimes, divorce followed, making the victim's social banishment complete. Of course, the film story had nothing to do with my favourite actor's personal experiences from which it took only its title - Rough Treatment. The writer of the script contributed the rest and also the actors, who greatly helped to shape this partly improvised film. I think that Zbigniew Zapasiewicz was virtually born to play the noble man suffering disgrace in such a heart-rending fashion, and Ewa Dalkowska - to personify a merciless modern woman. Also Krystyna Janda beautifully handled a part which was so new to her. The film was one of the first examples of the new trend of the "cinema of moral unrest", to use Janusz Kijowski's now well established term. Andrzej Wajda has taken a decisive step! After his splendid Man of Marble in which he portrayed stalinism at work in Poland during the fifties, the Polish premiere of Rough Treatment is a notable event: it presents the first daringly critical portrait of the country's present-day reality.(...) After the Grand Prix award in Gdansk, the film was attacked by the Party press. The public acclaimed it as its favourite choice. After a special showing for foreign journalists, a Soviet critic complained that the characters "lacked psychological credibility". To which Wajda responded with uncharacteristic ferocity: "What are you talking about? It's about politics, not psychology!" . All party critics conspired to treat the film as a "fairy tale", claiming it had nothing whatsoever to do with real life. Wajda's great works have been produced in co-operation with major writers: Wyspianski, Reymont, Iwaszkiewicz. When he picks up utilitarian scripts of little or no artistic merit, his artistic standards dramatically deteriorate and get lost in blind alleys. (...) I consider it important to point out in all seriousness what I find offensive in this strangely commonplace story, supposedly striving for the status of a historical metaphor. I object to the false assumption that our reality works against the most talented and successful individuals.(...) It is customary for the artistic milieu to overrate the influence of the Philistines, allegedly intent on trampling over the higher flights of the human spirit. Naturally enough, this myth has been mostly sustained by less successful artists giving vent to their personal frustrations. It is quite surprising to see this myth promulgated by Andrzej Wajda - the paragon of artistic success. Much has been said about the ambiguity of Rough Treatment. What ambiguity are we talking about? It is true that the characters seem ambiguous: they don't explain themselves; we don't know why they act as they do; they sometimes defy the rules of logic and psychology. However, their fates are woven into a story whose subject, as well as style, is easy to read. Rough Treatment is a sequel to Man of Marble, as both films deal with stalinism.(...) 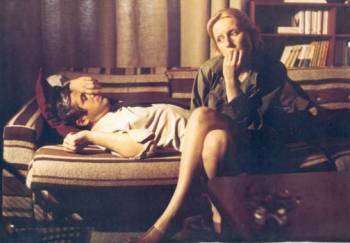 Could Wajda have gone any further in presenting contemporary Poland? Statements such as: "everything can be proved, if necessary", or "guilt is an elastic notion, everything depends on interpretation", are justified by the plot, and do not appear to be generalisations. (...) Rough Treatment is important because of the things it tells us about both post-stalinist Poland, as well as about Wajda himself.